Daintree Rainforest. Photo taken June 2005. Image: Wikipedia. 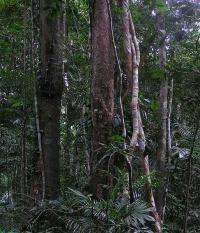 (PhysOrg.com) -- Large areas of rainforests in Central Africa mysteriously disappeared over three thousand years ago, to be replaced by savannas. The prevailing theory has been that the cause was a change in climate, and the deforestation then enabled humans to increase their agricultural activities. A new study suggests that climate change alone cannot fully explain the transition and that human activities might be implicated. Geochemist Germain Bayon and colleagues from the French Research Institute for Exploration of the Sea in Plouzané, France, analyzed marine sediment cores representing the last 40,000 years, taken from the mouth of the Congo River. The team looked for geochemical markers such as hydrogen, which correspond to rainfall levels that affect natural levels of erosion, and they also looked at potassium, which erodes quickly, and aluminum, which is more immobile. The core samples revealed evidence of severe chemical weathering starting around 1,500 BCE, a time that coincided with a period in which Bantu-speaking tribes arrived in the area, having migrated from regions near what is now the border between Nigeria and Cameroon. Chemical weathering in samples dating before this era was consistent with the changes in rainfall patterns, but by 1,000 BCE the weathering seen was decoupled from the rainfall evidence. Chemical weathering can be caused naturally by rainfall and normal erosion, but it can be accelerated by deforestation and intensive agriculture. Since the climate was changing at the time and becoming drier, a reduction in chemical weathering would ordinarily be expected rather than the peak actually found. The Bantu people were farmers and had developed iron-smelting techniques. Iron-Age Bantu archaeological sites have yielded ceramics, furnaces, tools, the remains of agricultural products, and a variety of iron artifacts. The papers authors say their results were unexpected, but reveal that humans can have an enormous effect on the environment. While their findings do not necessarily contradict the prevailing theories, because the changing climate enabled the farmers to practice agriculture in the region, the Buntu farming practices themselves then changed the patterns of soil erosion. The study could have implications for the current situation in the worlds largest rainforests in the Amazon, where large areas are being deforested, largely for cattle or soy bean farms, and for industrial purposes and road construction. This, together with the current changes in climate, could also result in a rapid disappearance of remaining rainforests and their replacement by grasslands, with a massive resultant loss in biodiversity, and feedback changes to the local climate. Rainfall in the Amazon is already reducing, and there have been major droughts, notably in 2005 and 2010. About 3000 years ago, a major vegetation change occurred in Central Africa, when rainforest trees were abruptly replaced by savannas. The consensus is that the forest disturbance was caused by climate change. We show here that chemical weathering in Central Africa, reconstructed from geochemical analyses of a marine sediment core, intensified abruptly at the same period, departing significantly from the long-term weathering fluctuations related to the Late Quaternary climate. Evidence that this weathering event was also contemporaneous with the migration of Bantu-speaking farmers across Central Africa suggests that human land-use intensification at that time already had a significant impact on the rainforest. No wonder since science brought us 26 years of needless panic with climate blame and their pesticides and cancer causing chemicals that scientists are called "lab coat consultants". You fear mongers are no worse than "say anything" to get elected politicians. Bit harsh. Not all scientists, nor even all climate scientists are part of the debacle. On the plus side, this might mean that efforts to repair the damage using modern desert reclamation techniques may not have to be perpetually maintained. A point might be reached where the system can begin sustaining itself through transpiration, aerosols and all the other tricks forests use to alter their regional climate on their own behalf. I say "desert reclamation" techniques--many of these techniques are applicable across various dry climates like grasslands as well as real Sahara-like conditions further north. You're right, of course. But guilt by association is a tough nut to crack. Youre missing the point. Overpopulation has been ruining the planet ever since the advent of agriculture. A vast swath from the gobi through the balkans, the middle east, and across subsaharan africa had been deforested, saltified, desertified, and ruined by overpopulation. The sahel continues to move southward due to human activity. In north america amerinds burned forests to create grazing for the buffalo as far east as new jersey. Who knows how much of the great plains or the sahara is due to the actions of humans? The whole world should look like this by now but it doesnt. A Solution was found to the scourge. -Leaders decided that the people, and not each other, were the enemy. They decided to Manage war by dividing the people up and setting them against each other in Constructive and Beneficial ways. This Process continues today. It has been wildly successful in preserving the world and protecting the people from themselves. "12 with them in all their uncleanness. And when their sons have slain one another, and they have seen the destruction of their beloved ones, bind them fast for seventy generations in the valleys of the earth, till the day of their judgement..."
Shall they complete in peace." A National Geographic transect of the Congo basin (maybe a decade ago?) found nuts of the oil palm in some of the creeks. This is a domesticated species that does not grow naturally in that area now. So it hasn't always been like it is today. Needed: a search to see if those nuts were carbon-dated. About 5000 years ago to 3500 years ago temperatures rose about 4C. I don't think humans did that. No need to remind us that you don't think. Overpopulation has been ruining the planet ever since the advent of agriculture. "ruining the planet" according to whom, and measured against what standard? GhostofOtto, are you implying a conspiracy theory? It sounds like a sexed-up version of what I've heard Alex Jones claim. Human conflict and warfare has much in common with chimpanzee warfare, naturally. Since we are only a slightly different species, it would be entirely plausible that our motivations are the same -- territory and power. This seems like a much more reasonable and parsimonious approach to the problem than positing a international conspiracy to either wipe out humanity or mitigate its growth. Go to any city council meeting and see how well people get along there. Now recreate this scenario on a global scale with differing cultures and value systems, along with megalomaniacal leaders and it seems much more likely that our countries go to war for much more boring and primitive reasons because we are much more a part of the animal kingdom than we like to admit. Perhaps I am thinking too linearly, but your idea sounds far-fetched. This will probably show up on Fox News only slightly altered. "Humans may have helped the decline of African rainforests 3000 years ago" Is Science Responsible? Interesting how much climate fanatics panic over a .3C rise over 100 years (HADCRUT3) but then freak out if I point out 4C changes in temperature detected in the ice core data. No one seems to notice that Bantu peoples over three thousand five hundred years ago smelted iron. Our history books claim that the Hittites were the first to do this, or at least they did when I was a little boy; but that was when I also had a pet velociraptor for a watch dino. American history books had ignored this fact for decades out of baldfaced caucasian ethnocentricism. In fact the first iron was smelted in India many millenia ago, and if truth be known the smelting of iron is about ten thousand years old if the Vedic stories of Vimanas are true, as no aircraft is possible without iron and other advanced smelting and alloying techniques. Look for really old electronics to show up in northwest India under the sea if it survived the elements. "Domesticated animals had already been imported from Asia between 7500 BC and 4000 BC. Interestingly, the domestication of the pig in the Sahara and ancient Egypt has been cited as a likely primary contributor to the desertification of the Sahara." "Poorly drained irrigated soils, in an arid climate with high levels of evaporation, led to the buildup of dissolved salts in the soil, eventually reducing agricultural yields severely. During the Akkadian and Ur III phases, there was a shift from the cultivation of wheat to the more salt-tolerant barley, but this was insufficient, and during the period from 2100 BC to 1700 BC, it is estimated that the population in this area declined by nearly three fifths." There is documented evidence of iron smelting in Northeast India just shy of 2,000 years BCE, and certainly the Iron Pillar of Delhi is an almost unbelievable display of skill given its age. However while there are many Bronze Age (i.e. pre-Iron Age) archeological sites in that country, there is no evidence for any mixing of the periods. In terms of education, I think -as is now accepted- it is more likely we underestimated ancient trade patterns rather than indigenous technologies. Happy to be challenged if you know of evidence that does not fit the consensus though, as long as it's not only from religious texts. From 4800 to 3300 BP temperature rose by 3C. That really changes what crops will grow where. There is a weird assumption going around that climate was exactly the same in the past when in fact climate fluctuations were huge. Maybe the people died off because they could not adapt? Who is assuming the climate ever was static? Temperature changes in Greenland cannot be directly compared with Central Africa anyway. The authors of this paper seem to ignore huge temperature changes. Greenland ice cores are a proxy for temperature. They should have mentioned the possibility of climate change.